A regular breeding resident and migrant; occasionally a few birds overwinter. The Chipping Sparrow was a very abundant species during the Minnesota Breeding Bird Atlas (MNBBA). Broadly distributed across North America, from eastern Alaska south through California and east to the Atlantic Coast. It is a year-round resident throughout much of the southeastern United States and in scattered areas of Central America. In the western United States, it is rare to absent from portions of the central Great Plains, California’s Central Valley, and portions of Washington and Oregon. The Chipping Sparrow reaches some of its highest breeding densities in British Columbia and in the eastern United States, from the Great Lakes states south through the Appalachian region (Figure 1). A short-distance migrant that winters in the southern United States and northern Mexico. An omnivorous ground forager that feeds primarily on seeds supplemented with insects during the breeding season. An open-cup nest often placed at variable heights within a coniferous tree or shrub. Breeding distribution and relative abundance of the Chipping Sparrow in North America based on the federal Breeding Bird Survey, 2011–2015 (Sauer et al. 2017). It dwells familiarly about our homes and builds its nest in the ornamental shrubbery, even in the vines and shrubs about our doorsteps. It is equally at home in wilder places and is an abundant bird in the spruce groves and open glades of the northern forests, where, like the Robin, it seems somewhat out of place to those who are wont to associate it with civilized surroundings. Here, the nest may be found at some distance from the ground in a tamarack or spruce tree in the midst of wild, densely wooded bogs, where a second look is required to satisfy one that the owner is really the sociable little Chippy of the garden shrubbery at home. Little has changed since the days of Roberts. Green and Janssen (1975) and Janssen (1987) each described the species as a common summer resident throughout the state. Green and Janssen cited its abundance in the eastern and central regions of the state, while Janssen claimed it was most abundant in the eastern and northern regions. Janssen also included a map identifying 45 counties where nesting had been confirmed since 1970. Hertzel and Janssen (1998) later added another 11 counties to the list. The Minnesota Biological Survey reported a total of 973 breeding season locations. Reports were common from all but the most intensively cultivated regions of the Red River valley (Minnesota Department of Natural Resources 2016). MNBBA participants reported a total of 6,349 Chipping Sparrow records in 65.4% (3,135/4,792) of the surveyed atlas blocks and in 83.8% (1,959/2,337) of the priority blocks. Breeding evidence was documented in 13.7% (657) of the surveyed blocks (Figures 2 and 3; Table 1). Chipping Sparrows were the seventh most commonly detected species during the entire atlas and were reported from each of Minnesota’s 87 counties. They were confirmed breeding in all but 1 county, Faribault. The Chipping Sparrow’s predicted distribution map, which integrates MNBBA data with habitat, landscape context and climate data, predicts the species’ highest breeding densities are attained in the Twin Cities metropolitan region as well as in other communities throughout the Eastern Broadleaf Forest Province (Figure 4). Although it is present statewide, the lowest breeding densities are predicted to occur along the North Shore of Lake Superior in eastern Lake and Cook Counties and in the Tallgrass Aspen Parklands Province in northwest Minnesota. Atlas data confirm that the Chipping Sparrow remains as widespread today as it was in Roberts’s day, more than one hundred years ago. Although its breeding density may be lower in some regions of the state than in others, it remains a common and even abundant species throughout most of Minnesota. An inhabitant of open woodlands, the species benefitted from the clearing of North America’s eastern deciduous forest in the 1800s. Several accounts mention its subsequent decline following the introduction of the House Sparrow (Bent 1968; Cutright et al. 2006; Middleton 1998). In the Twin Cities the House Sparrow was well established by 1877, but Roberts (1932) makes no mention of any impact the exotic invasive had on the native Chipping Sparrow in Minnesota. Overall, the species is considered more abundant and widely distributed today than it was prior to European settlement (Middleton 1998). Breeding distribution of the Chipping Sparrow in Minnesota based on the Breeding Bird Atlas (2009 – 2013). Summary statistics of observations by breeding status category for the Chipping Sparrow in Minnesota based on all blocks (each 5 km x 5 km) surveyed during the Breeding Bird Atlas (2009-2013). Summary statistics for the Chipping Sparrow observations by breeding status category for all blocks and priority blocks (each 5 km x 5 km) surveyed during the Minnesota Breeding Bird Atlas (2009-2013). Predicted breeding distribution (pairs per 40 hectares) of the Chipping Sparrow in Minnesota based on habitat, landscape context, and climate data gathered during the Minnesota Breeding Bird Atlas (2009-2013) using the General Linear Modeling method with an adjustment for detectability. As common as the Chipping Sparrow is in urban settings, it is easy to overlook the fact that it is first and foremost a forest inhabitant that has easily adapted to the manicured habitats of urban landscapes (Figure 5). Although it may be found in a variety of forest habitats, the species shows a strong preference for conifer stands ranging in age from recent clear-cuts to mature forests. The species is also found in lowland conifers dominated by spruce and tamarack (Green 1995; Danz et al. 2007). Open understories, or the adjacency of open areas to forest stands, are critical habitat components because of the sparrow’s ground-foraging habits. As a result, the species is also associated with open woodlands and forest edges. The open nature of landscaped city parks and housing subdivisions are perfectly suited to the Chipping Sparrow’s habitat requirements. Even in the extensively forested landscapes of the four national forests that occur in northern Minnesota and Wisconsin, the Chipping Sparrow was most frequently associated with small towns embedded within the forests’ boundaries. Throughout Minnesota, the most common habitat found within 200 m of MNBBA point counts where Chipping Sparrows were detected was development, followed by oak forests, pine forests, and pine-oak barrens (Figure 6). Typical breeding habitat of the Chipping Sparrow in Minnesota (© Gerald J. Niemi). Habitat profile for the Chipping Sparrow based on habitats within 200 m of point counts where the species was present during the Minnesota Breeding Bird Atlas (2009-2013). Using data collected by the federal Breeding Bird Survey (BBS), Partners in Flight has estimated the global population of the Chipping Sparrow at 210 million birds (Rosenberg et al. 2016). In 2013 Minnesota was estimated to support 1.8% of the North American population, which results in a statewide population estimate of 3.8 million breeding adults (Partners in Flight Science Committee 2013). A statewide population estimate generated using MNBBA point count data was slightly higher at 4.5 million adults (95% confidence interval of 4.1 to 4.8 million). Given the wide expanse of the Chipping Sparrow’s breeding range, including the far northern reaches of the Canadian provinces and Central America, the BBS survey area depicted in Figure 1 does not cover its entire range. Nevertheless, within southern Canada and the United States, BBS data indicated the highest breeding densities occur west and south of Minnesota. In Minnesota, an average of 13 Chipping Sparrows are observed per BBS route in the state each year. This compares to an average of 23 per route in Wisconsin and 34 in Michigan; Michigan supports the highest densities in the United States (Sauer et al. 2017). On Minnesota’s two national forests, the local breeding densities of the Chipping Sparrow average 3.1 pairs per 40 ha in the Chippewa National Forest and 1.5 pairs per 40 ha in the Superior. In the Chippewa the sparrow reached its highest breeding densities on regenerating upland conifer stands (11.2 pairs per 40 ha); in the Superior it was most abundant in mature white pine stands (3.4 pairs per 40 ha) (Niemi et al. 2016). Across the BBS survey area, data reveal a population that is declining at the significant rate of 0.60% per year (Sauer et al. 2017). Behind this overall assessment of its status are wide regional differences. Populations in the western United States and Canada are showing strong declines, while populations in the central United States are faring quite well. Although it is quite variable, eastern populations are largely stable to decreasing (Figure 7). The population trend in Minnesota mirrors the increasing trend that is seen elsewhere in the heart of the country, with a significant annual increase from 1967 to 2015 of 0.58% per year (Figure 8). By contrast, in Minnesota’s two national forests, the Chipping Sparrow has demonstrated a significant annual decline of 2.32% per year in the Chippewa National Forest and 2.60% per year in the Superior National Forest (Figure 9). The decline may be attributed in part to the recent decrease in forest harvesting activities documented in both forests, especially given the sparrow’s high breeding densities in young regenerating conifer stands in the Chippewa (Niemi et al. 2016). Factors often cited as responsible for local population declines include Brown-headed Cowbird parasitism, competition in urban areas with the House Sparrow and the House Finch, forest succession that reduces forest openings, and more intensive agricultural practices that eliminate shelterbelts and small woodland tracts. In contrast, factors cited for local population increases point largely to increased settlement and the landscape plantings that accompany such development (Middleton 1998). Population trend map for the Chipping Sparrow based on the federal Breeding Bird Survey, 1966–2015 (Sauer et al. 2017). 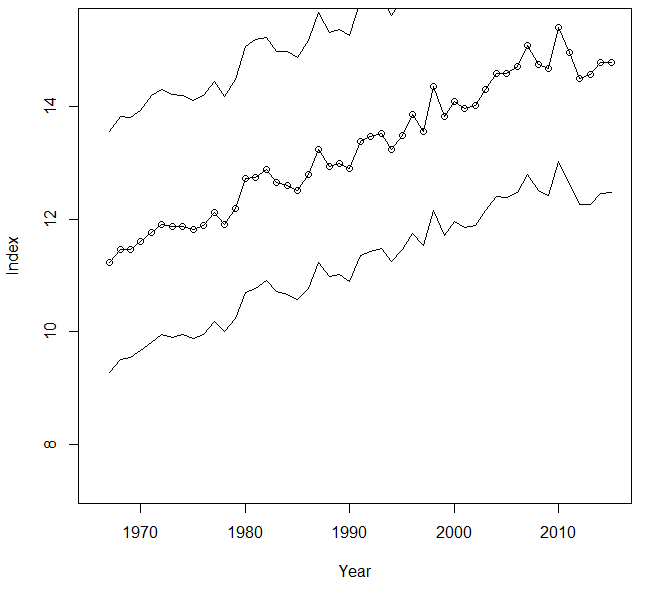 Breeding population trend for the Chipping Sparrow in Minnesota for 1967–2015 based on the federal Breeding Bird Survey (Sauer et al. 2017). 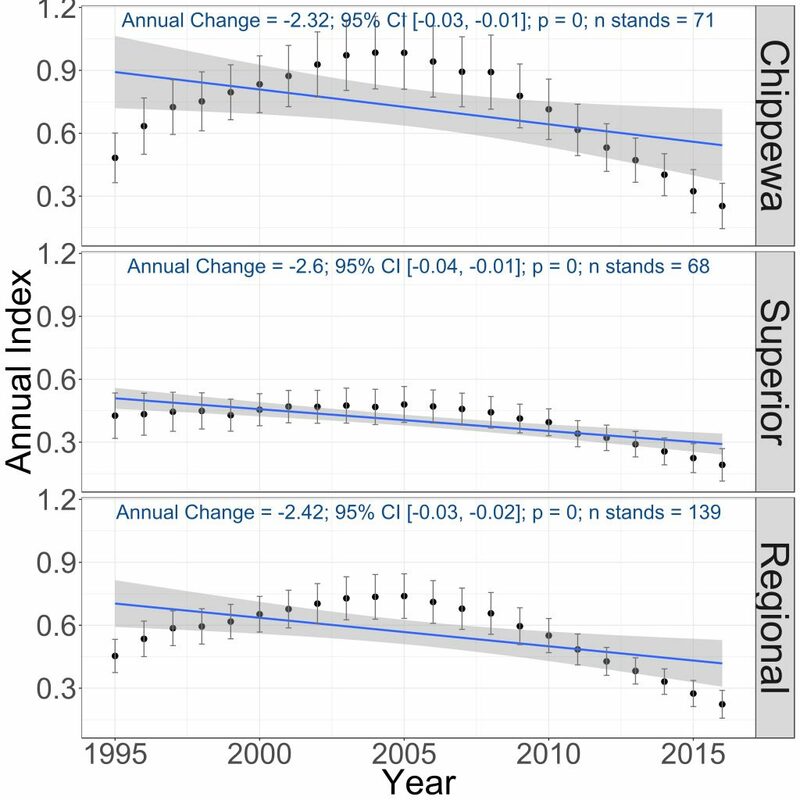 Breeding population trends of the Chipping Sparrow in the Chippewa and Superior National Forests and the combined regional trend, 1995–2016 (Bednar et al. 2016). In light of its broad distribution, its large population size, and its adaptability to human-modified landscapes, the Chipping Sparrow is not a species of conservation concern at either the federal or state level. Its Continental Concern Score of 8/20, assigned by Partners in Flight, reflects the low level of concern. Although warming temperatures are a concern for many of North America’s birds, initial assessments rank the Chipping Sparrow’s vulnerability as low (North American Bird Conservation Initiative 2010). Given its strong association with urban landscapes, the future of the little Chipping Sparrow appears quite secure for many years to come.